My husband and I flew from our home in Japan to the U.S. state of Alabama to seek treatment for his pancreatic cancer. I was a Seventh-day Adventist, and I had heard that Adventist doctors working at a health resort called Uchee Pines Institute might be able to help. My husband wasn’t a Christian. As we ate vegan food and exercised, our bodies began to change. I lost a lot of weight. My husband quit smoking. He also began to read the Bible and was baptized at the institute. My husband died a week after his baptism. He was 56. I was sad, but I also was happy because we had agreed to meet again in heaven. One day, I read Isaiah 55:13 during my devotions. The verse says, “Instead of the thorn shall come up the cypress tree, and instead of the brier shall come up the myrtle tree; and it shall be to the Lord for a name, for an everlasting sign that shall not be cut off” (NKJV). That same day, I walked down a street in my hometown just outside Tokyo and saw a plot of land for sale. It was the perfect site and located near three Adventist churches. I bought the vacant lot and paid for the restaurant to be built. 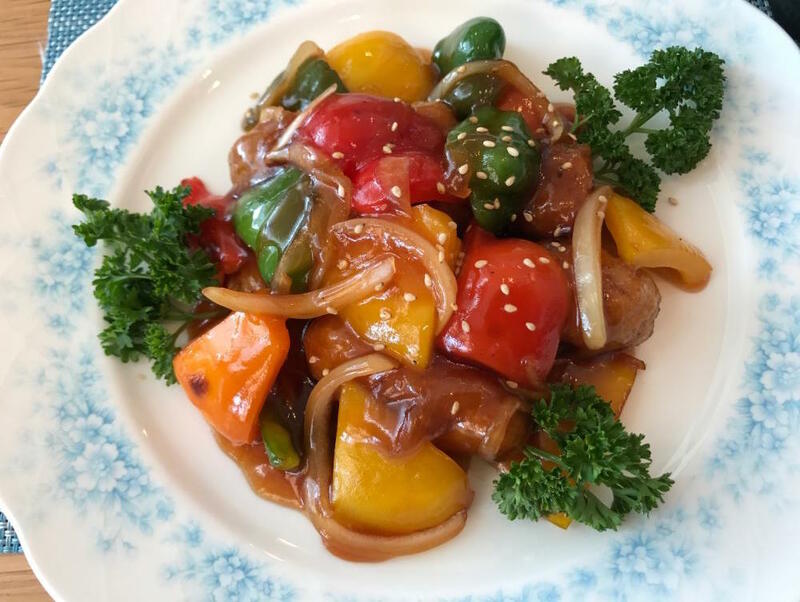 One of Hasegawa Harue's signature dishes contains soy meat and bell peppers doused in a sweet and sour sauce. 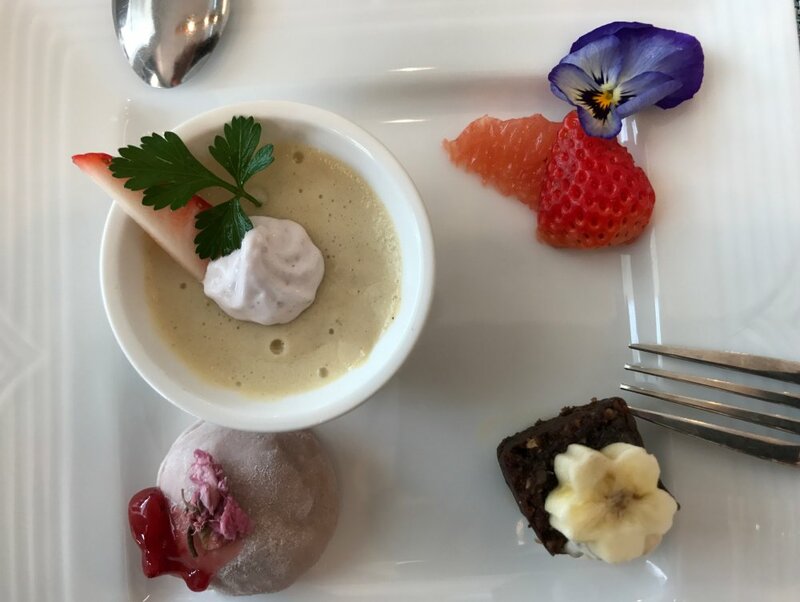 A dessert plate includes, clockwise from bottom right, a banana-topped carob brownie, frozen banana puree, soy vanilla pudding, and fresh fruit with an edible flower. To be honest, I knew nothing about the restaurant business. I have worked for MET international insurance company for 38 years. So, I attended an Adventist vegetarian cooking school to get some ideas and then created my own meals for the restaurant. A good-sized crowd showed up on the day that the restaurant opened. But it was chaos inside. I still knew nothing about running a restaurant. One of the diners, a former insurance client, knew someone who owned a nearby café and asked her to help me. She helped a lot! Business has been good. 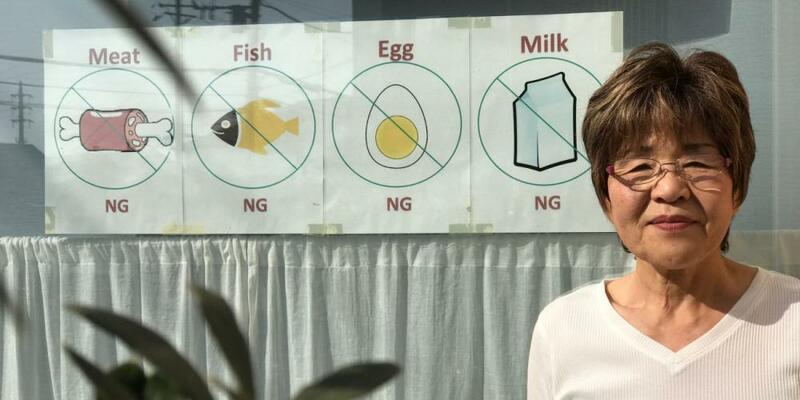 Myrtle is one of the few vegan restaurants in the Tokyo area. I still go to my insurance job in the morning. Then I go to the restaurant at 11 o’clock and serve lunchtime customers until 2 o’clock. After that, I return to my insurance job. The restaurant is closed on Sabbaths, of course. I’m seeing people’s health change just as mine did. One diner has breast cancer, and she asked for information about a healthy lifestyle. I shared some Adventist literature with her. Another diner, a single woman, told me that she was looking for new friends. I invited her to visit my church, and she has come several times. The main goal of the restaurant is to lead people to Jesus. Ellen White says, “Our restaurants must be in the cities, for otherwise the workers in these restaurants could not reach the people and teach them the principles of right living” (“Selected Messages, Vol. 2,” p. 142). That’s why I started this restaurant. This is God’s restaurant. God is helping me to run it, and the owner is Jesus. ‘In the Dream, I Saw 2 Ministers’ What happened when two ministers distributed tracts in Texas. Taiwanese Worker Chooses God’s Sabbath Over Bicycle Frames “I wanted to keep my faith more than I wanted a higher salary,” says Jin Rong Gao.